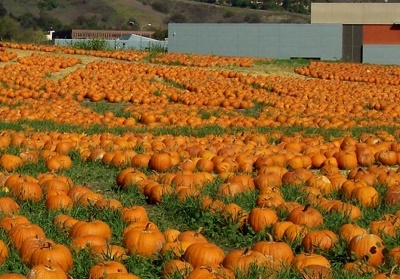 Los Angeles area of California Pumpkin Patches, Corn Mazes, Hayrides and More - Find Halloween and Fall Fun! Looking for a local pumpkin patch, corn maze, hayride, gourds and other Halloween activities in Los Angeles area of California? Scroll down this page and you will see the all of those in Los Angeles area of California, sorted by county. Some are farms, where you take a hay ride out into the field, others are elaborate farm stands with mountains of pumpkins and other activities and some are simple roadside stands. Most have loads of pumpkins to choose from. To really make it fun for your kids, look for those that have the extra activities, like a corn maze, spook house, or hayride. There is usually a small fee for the mazes (of course, the more elaborate mazes tend to charge more. Hayrides are often free. ALWAYS call before you go to confirm the info, they don't always report changes to me! A visitor writes on October 05, 2009: "They also have horse rides during Pumpkin season. They have goats to pet and feed." 34810 Largo Vista Rd, Llano, CA 93544. Phone: 661261-3216. Email: felice@brianranch.com. Open: Saturday and Sunday 8 am to 2 pm and by appointment, October 1 to October 31. Directions: Click here for our map. or Click here for a map and directions.. Payment: Cash, only. Juan Bautista De Anza Park, Calabasas, CA 91302. Phone: 818-222-5650 . Email: info@calabasaschamber.com. Open: Held only on October 17 and 18, 2015, 10am to 5pm. Directions: Lost Hills Exit off of the 101 Freeway in Calabasas. And for a map to our farm, click here. Crops are usually available in October. Payment: Cash, only. Rides, games, live bands, delicious food, arts and crafts and other fall family fun. There's also pumpkin bowling, pumpkin beer, pumpkin bread and pumpkin pie. Did you know that Calabasas got its name from the Spanish word “Calabaza” meaning “pumpkin” or “gourd”? 10600 Leona Ave, Leona Valley, CA 93551. Phone: 661-622-4480. Email: info@upickcherryhouse.com. Open: Saturday 9am to 6pm and Sundays 10am to 6pm, open during the week for large groups, school groups, churches, etc; Call to arrange weekday hours. Click here for current open hours, days and dates. Directions: Located off highway 14, near Palmdale, CA. Click here for a map and directions. Farmers Stand is open on Sundays. Payment: Cash, Visa/MasterCard. Click here for our Facebook page. 2551 Motor Ave, Los Angeles, CA 90064. Phone: (310) 473-3070. Email: irene@ezeventproduction.com. Open: Friday, Saturday and Sunday, from 10am to 6pm on Oct 23,24,25th; Special Halloween Hours on Friday, October 31st, 10am to 8pm. Click here for current open hours, days and dates. Directions: Click here for a map and directions. Payment: Cash, Debit cards, Visa/MasterCard, Discover, AmEx. Pumpkin Patch, Train Ride, Arts & Crafts, Seasonal Treats & Food Trucks, Hay Maze, Apple Bobbing, Face Painting, Scarecrow Making Contests, Costume Parade and Contest on October 31, Bounce Houses, Trick or Treating on October 31, Make Your Own Spooky Cupcakes, We-Be-Little Zone, picnic area. Gilchrist Farm - Pumpkins, pony rides, petting zoo, wagon rides, farm crafts, live bands, community fundraisers, pig races, shooting gallery, straw bale maze and more! A visitor writes on August 09, 2017: "Gilchrist Farm Harvest Festival and Pumpkin Patch will launch on . No parking or entry fees. " 200 Main Street, Huntington Beach, CA. Phone: (714) 960-8895. Open: October 31, from 5 pm to 9 pm. Trick or Treat on Main Street, Downtown HB. Halloween Fest on Main Street. Cost: Free. Kids can Trick or Treat with local merchants in downtown HB and enjoy free activities such as Pony Rides and Petting Zoo. Halloween on Main -Thousands come to Downtown Huntington Beach for kids entertainment, coloring booths, petting zoo, pony rides, bounce houses, trick or treat downtown and too much fun to mention in one paragraph. Cost Free, candy may run out some come early! Location: 200 Main St. parking, Huntington Beach, CA. Kids can wear costumes for costume contest, and a separate Howloween contest for dogs takes place. Call: (714) 536-8300. 7353 Clybourn av, sun valley, CA 91352. Phone: 818-759-7159. Fax: 818-759-7166. Email : kennyodesign@sbcglobal.net. Directions: 5 freeway north to Sunland Blvd south to Valerio make left to Clybourn av. we are located the corner of Valerio and Clybourn And for a map to our farm, click here. Crops are usually available in October. Open: Tuesday thru Sunday 9 am to 5 pm Friday open till 7 pm Sunday hours are 10 am to 4 pm call for extended holiday hours October thru December pumpkin patch is open October 6 thru October 31 flower shop and nursery are open year round. cut flowers and arrangements available year round Payment: Cash, Check, Visa/MasterCard, AmEx. tropical plants, bedding plants, banana trees, hanging baskets, indoor and outdoor plants. Brookside Park, 480 North Arroyo Blvd, Pasadena, CA 91103. Phone: (626) 449-9144. Fax: (626) 449-9985. Email: info@kidspacemuseum.org. Open: Saturday, October 17 and Sunday, October 18, 2015 from 9:30am to 5:00 pm. This family-friendly event includes fun for all ages and will be hosted in Brookside Park, directly in front of Kidspace Children's Museum. Kids will giggle with delight at the petting zoo, pony rides, exciting bouncers, carnival games, and seasonal crafts. Partake in a costume parade, make your own take-home fall crafts, enjoy face painting, and select pumpkins from our pumpkin patch. Parents will love the book and costume sale, and tasty picnic treats. Festival admission is free - as well as the live music/ performances, selected crafts, promotions at the Radio Disney tent, and a photo opportunity at the pumpkin patch. There is also plenty of free parking in Lot I of the Rose Bowl adjacent to Brookside Park. Tickets are available for purchase to enjoy the bouncers, pony rides, games, food, and many other festival attractions. A visitor writes on October 08, 2011: "Sweet couple that own the place. Very friendly environment. I take my kids there aver year to pick out their pumpkins for carving and grab a few extra goodies." A visitor writes on October 12, 2009: "Its in Santa Clarita. Its the best"
A visitor writes on October 05, 2009: "We love this farm...we go every year to get our pumpkins. I even have my boyfriend going with us - he is more excited than our daughter most of the time. Enormous amounts of pumpkins to choose from...and we always get the Indian corn and some fruit/veggies on the way out." 10100 Jefferson Blvd, Culver City, CA 90069. Phone: 310-276-9827. Email: info@mrbonespumpkinpatch.com. Open: October 2nd to 31st, 2015, Monday to Thursday from 10am-7pm; Friday and Saturday from 9am-9pm; and on Sunday from 9am-8pm; Activities have separate hours. Directions: Click here for a map and directions. Payment: Cash, Debit cards, Visa/MasterCard, AmEx. Petting Zoo - Come play with our baby goats, sheep and ducks! Jumpin' Pumpkin, Pony Rides, Face Painting, Mr. Bones' Super Slide, Straw Maze, Pumpkin Decorating, Giant Rockin' Horses and more. Click here for a link to our Facebook page. 25039 Magic Mountain Pkwy, Santa Clarita, CA 91355. Phone: 661 255-6943. Fax: 661 255 6943. Email: nancy@nancysranch.com. Open: first Saturday in October thru Halloween, from 10 am to 7 pm. NancysRanch@aol.com. Open: Weekdays from 10am until 7pm; Weekends from 9am until 7pm. Click here for current open hours, days and dates. Directions: 1/4 mile East of Interstate 5 on Magic Mountain Pkwy. Click here for a map and directions. Prices $1 to $75. Christmas Tree Season: Open Friday after Thanksgiving thru Christmas Eve. Payment: Cash, Check, Debit cards, Visa/MasterCard, Discover, AmEx. Click here for a coupon. 6701 E Pacific Coast Hwy, Long Beach, CA 90803. Phone: (562) 596-7741. Email: treeman942@yahoo.com. Directions: on PCH, near PCH and 2nd street, across the street from Whole Foods Download a map by clicking here. Open: September 25 Through Halloween; hours are September 25 to October 15 on Monday to Friday from 11:00am to 9:00pm, Saturday - Sunday 10:00am to 9:00pm; then October 16-3oth on Monday - Sunday from 10:00am to 9:00pm and on October 31, 2015 from 10:00am to 6:00pm. We offer a large variety of pumpkins to choose from, as well as haystacks, corn stalks and gourds. We also have a snack bar, pony ride, a petting zoo and a variety of games and rides. A fun place for the whole family, and a great getaway for school groups, scout groups, birthday parties and special events! A fun place for the whole family, and a great getaway for school groups, scout groups, birthday parties and special events! 900 North Lake Avenue, Pasadena, CA 91104. Phone: 626-622-4893. Email: pasadenapumpkinpatch@gmail.com. Open: Every day in October (Monday, Tuesday, Wednesday, Thursday, Friday, Saturday, Sunday) from 10:00 am to 10 pm. Click here for current open hours, days and dates. Directions: We are located at the CVS parking lot On the corner of Mountain Street and North Lake Avenue North of the 210 Freeway. Click here for a map and directions. Pasadena Pumpkin Patch October 1st to October 31st. We minimize use of pesticides and other chemicals. Payment: Cash, only. Click here for our Facebook page. Celebrate Halloween in Pasadena with a visit to our family-friendly Halloween Pumpkin Patch filled with Activities for all ages! Wander through the pumpkin patch to pick your perfect pumpkin! Explore the petting zoo, where kids and adults are welcome to meet and feed goats, rabbits, pigs, ponies, sheep, chickens, donkeys and more! Slide down our Spectacular Super Slides! Laugh and bounce in our Fun Giant Bounce Houses! Bring your camera for pony ride photos! Book your child's Birthday Party and Special Events. Pasadena Pumpkin patch has been in business for over 20 years! We are a family business that provides the best pumpkins of all shapes, colors, and sizes at the best prices. Ask about wholesale prices. 20800 Victory Blvd, Woodland Hills, CA 91367. Phone: 818 999-6300. Fax: 818 700-9720. Email: events@piercefarmcenter.com. Open: This year the festival is open for 6 weeks, late September through early November; Sunday through Thursday 10am to 10pm, Saturday and Sunday 10am to Midnight. Directions: From 118, exit at DeSoto, Head South on DeSoto for about 6 miles, Turn left at Victory Blvd, Turn Right immediately after your turn into the Halloween Harvest Festival. From 101, exist at DeSoto, Head North on DeSoto for about 2 miles, Turn Right at Victory Blvd, Turn Right immediately after your turn into the Halloween Harvest Festival. And for a map to our farm, click here. "Spookley" the square pumpkin and his friend Jack the scarecrow at the all new Holiday Hill Farms stage show inside our very own pick your own pumpkin patch. This themed activity offers a chance to see Spookley the Square Pumpkin LIVE in his very own stage show and actually harvesting your very own pumpkin.Christmas Trees: Day after Thanksgiving through December 24, Sunday through Saturday 10am to 10pm. Payment: Cash, Visa/MasterCard, Discover. Nordman Christmas Trees also available. We offer delivery of your Christmas Tree. We offer custom flocking of your Christmas Tree. Click here for a link to our Facebook page. They have many locations. Click here for their table of locations and more information. 5251 Hayvenhurst Ave, Encino, CA 91436. Phone: 818-905-6155. Open: 9 am to 6 pm daily. Directions TapiaFarm@gmail.com. Open: Pumpkin Patch and Farm Produce Stand: 9:00 am to 6:00 pm Monday to Saturday 9:00 am to 5:00 pm on Sunday; Hayride, Corn Maze, and tractor - pulled train ride hours: 10:00 am to 5:00 pm daily. Directions: We are located at 5251 Hayvenhurt Ave, Encino, CA. At the corner of Hayvenhurst and Burbank Blvd, just off the 101 freeway. From the 405: Exit Burbank, head west about 2.5 miles and make a left onto Hayvenhurst, patch will be on the right-hand side. Click here for a map and directions. Farm Stand featuring "world famous" sweet corn and vine ripened tomatoes open almost year-round; Open for Christmas trees from the 1st of December to Christmas eve; We are also home to "Tomatomania" in March. Payment: Cash, Check, Debit cards, Visa/MasterCard. We also offer a spook-house, mini cave, kid's jail, and a wide variety of fall decorations such as leaves, gourds, Indian corn, corn stalks, and hay bales. A visitor writes on October 27, 2010: "I went to school with the Tapia Bros. and will support them alllllll the way. Great prices, family works hard! During pumpkin patch weekends, sell roasted corn and have a picnic area.. Popular farm stand in the middle of the city during the rest of the year; known for their tomatoes and corn"
17475 Gale Avenue, City Of Industry, CA 91748. Phone: (818) 590-3813. Email: rickyarce@ymail.com. Open: Monday to Thursday from 3pm to 10pm; and Friday to Sunday from 9am to 11pm. Directions: Click here for a map and directions. Payment: Cash, only. There will be monster truck rides, live entertainment, carnival rides, kiddie rides, horizontal inflatable rides, vertical inflatable rides, and quad racing!!!!! Fun for all ages!!!!. Do you know of any other pumpkin patches that are within an hour or so of Los Angeles? If you do, tell me about them using the Feedback form! Thanks!!!!! Current Weather - Click on a map for forecast, or enter a zip code for a different location.